Washington, DC (February 25, 2019) — Today, Iraq and Afghanistan Veterans of America (IAVA), the leading voice of the Post-9/11 generation of veterans, applauds the introduction of the Never Forget the Heroes: Permanent Authorization of the September 11th Victim Compensation Fund Act. First responders bravely ran toward danger on September 11th, putting the welfare and survival of their fellow Americans before their own health and wellbeing. For months afterward, first responders worked through debris and wreckage from the 9/11 attacks, exposing themselves to toxins from the ash and debris that was everywhere. But they continued on and helped begin to heal a city after the most devastating attack on civilians in our nation’s history. We as a nation owe a great debt to these heroes. Ensuring 9/11 first responders have access to care and benefits is the least a grateful nation can do. 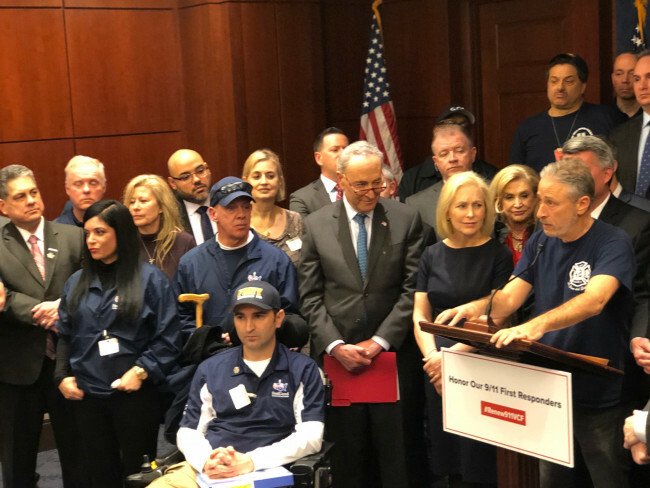 It is unacceptable that the 9/11 Victim Compensation Fund is running out of money which will result in benefit cuts to first responders, survivors and their families that are suffering from the physical impacts of toxic exposures from 9/11. The Never Forget the Heroes: Permanent Authorization of the September 11th Victim Compensation Fund Act will permanently establish and fund this important program so that no first responder will ever have this earned benefit stripped away from them. For years, IAVA advocated for health care and compensation of 9/11 first responders. In 2010, IAVA advocated for the James Zadroga 9/11 Health Compensation Act which was signed into law in January 2011. The Zadroga Act created the World Trade Center Health Program and September 11th Victim Compensation Fund. Following renewed advocacy efforts in 2015, the FY 2016 Omnibus spending bill included key provisions of the Zadroga Act that permanently extended the health care program for 9/11 First Responders. However, the Victim Compensation Fund (VCF) has only been extended on five-year cycles since 2010. The Never Forget the Heroes: Permanent Authorization of the September 11th Victim Compensation Fund Act will make the VCF permanent.